Hyderabad: Sandalwood star Kichcha Sudeep shared a picture from Sye Raa Narasimha Reddy shooting set. He is seen posing with Bollywood superstar Amitabh Bachchan, captioning it 'priceless moment'. 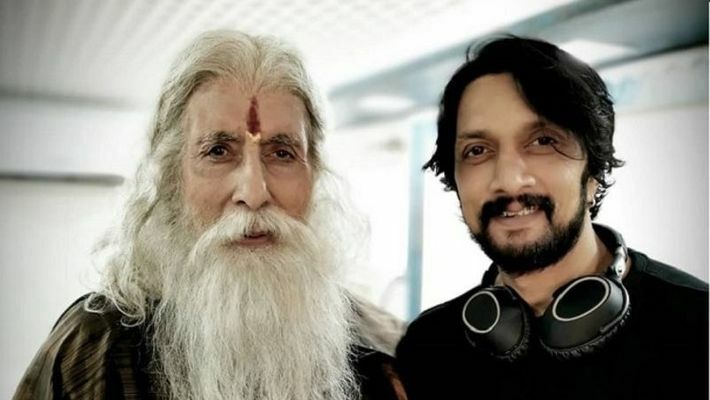 This is the second film of Sudeep with Amitabh Bachchan, after Hindi movie Rann. Amitabh Bachchan plays the role of Guru Gosayi Venkanna in Sye Raa Narasimha Reddy. Kichcha Sudeep is playing the role of Avuku Raja (ruler of Avuku dynasty) in the movie. The Telugu period drama stars Chiranjeevi in the lead role. He plays the role of Uyyalawada Narasimha Reddy, a legendary Telugu freedom fighter from Andhra, who fought the British in 1800s. The movie is directed by Surender Reddy. The multi star-cast includes Nayanthara, Jagapathi Babu, Vijay Sethupathi, Tamannaah and Brahmaji apart from Chiranjeevi, Amitabh Bachchan and Sudeep. The film is produced by Ram Charan of Rangasthalam, Magadheera fame. The movie is expected to release this year.